Posted: Tuesday 27th June 2017 in eCommerce Technology, News, Retail Strategy, Thought Leadership. In the last few weeks Amazon made the dramatic move from dabbling in the realms of bricks and mortar grocers, hardly getting their feet wet, to taking the plunge and buying Whole Foods. Grocery is not a new field to Jeff Bezos and the juggernaut that is Amazon, with AmazonFresh founded almost 10 years ago and early services around gourmet food trialled as far back as 2003. The online service AmazonFresh has grown from an invitation only experiment to contributing 0.7% of the US market in 2016. In May of this year it branched out into pickup points in Seattle. So why buy Whole Foods when they are already making traction with physical presence? Some Twitter users have suggested that it might have been a slip of Alexa’s voice recognition software that lead to the purchase, but the acquisition of such a large entity is no small task and not something undertaken lightly. I prefer the assessment of Dennis K Berman of the Wall Street Journal “Amazon did not just buy Whole Foods grocery stores. It bought 431 upper-income, prime-location distribution nodes for everything it does”. With sites across the US and stores in the UK, including Camden and Kensington, it is an impressive retail portfolio, putting thousands of affluent customers on Bezos’ doorstep. Should retailers worldwide be worried by the move? 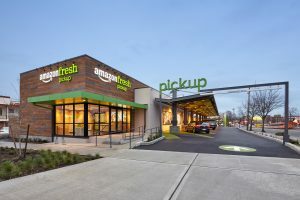 With massive logistical power and technical knowledge that sees them at the forefront of digital retail, Amazon certainly has the possibility of being a major player, on paper at least, but so far Amazon’s relationship with Grocers has been symbiotic as much as it has been adversarial. Amazon’s pick up points are now a familiar site at many major Grocers and 431 locations are just a drop in the ocean when compared to the global presence of Walmart with 11,723 or Carrefour with 11,935 locations. It looks more like Amazon’s move is referring back to their 2003 experiment with gourmet food and back to their early days as a retailer, when many independent bookstores found they could not compete with disruptive tactics, scale and technical advantage, leveraged by the fledgling online bookstore. Amazon has grown a lot in the 14 years since 2003 and they excel at making the most of every technology, whilst running at almost zero margin. Spending 12 Billion USD on R&D in 2016, more than Alphabet (Google) it shows that it is not afraid to invest. Lower operating margin potentially means more competition in the supply chain, with Amazon able to offer more than other retailers and with experiments like the Dash button and the Amazon store without a checkout, they don’t just challenge the established retail world, they seek to overturn it. For all the talk, it looks like the Hipsters have more to worry about with Amazon’s acquisition of Whole Foods, than the boardrooms of the major retailers for now, but it will remain one to watch with a great deal of caution and with an eye to spotting the next decisive advantage. 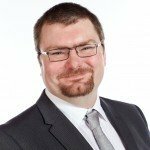 The challenge for Grocers and other retailers will remain to be maintaining the impetus and the political will that will see them evolve in the digital and technological space, or be wiped out by the rising tide of data and personalisation.